The Federal Government have given approval for intense 3D seismic testing along the East Coast approximately from Newcastle to Woy Woy. This 500 sq.km PEP11 site, a very short distance from Sydney’s Northern Beaches, is in the direct migratory path of the Humpback whales Megaptera novaeanglia, and home to dolphins, turtles and a myriad of marine life. Science-based evidence shows that ocean noise, such as sonar and seismic testing, has potentially wide ranging and devastating impacts on whales, dolphins and many, as yet not studied forms of marine life. To raise awareness in our community of the proposed testing and its potential impact, Northern Beaches ocean-based conservation group, Living Ocean, have partnered with Newcastle group ‘Save Our Coast’. 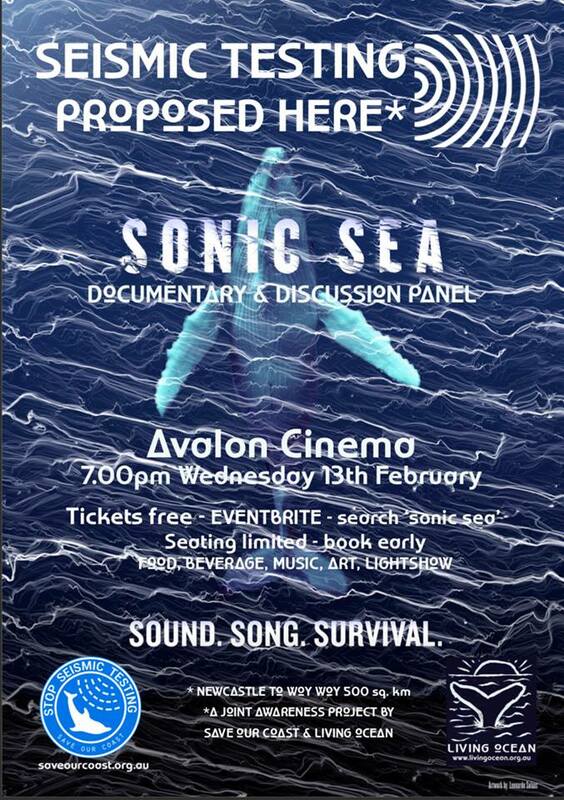 Together they are hosting a screening of the award-winning documentary, ‘Sonic Sea’, followed by a discussion with a panel of subject matter experts to allow the public to learn more. Experts including economist, Matt Koch and marine biologist, Libby Eyre and more, will be on hand to answer questions. The moderator is Rowan Hanley - Northern Beaches Council Eco Awards winner 2018. Living Ocean is an ocean-based conservation group on Sydney’s Northern Beaches promoting awareness of human impact on the ocean through research, education and community action. The group develops and nurtures close and important partnerships with schools, marine scientists, independent corporations and government agencies. 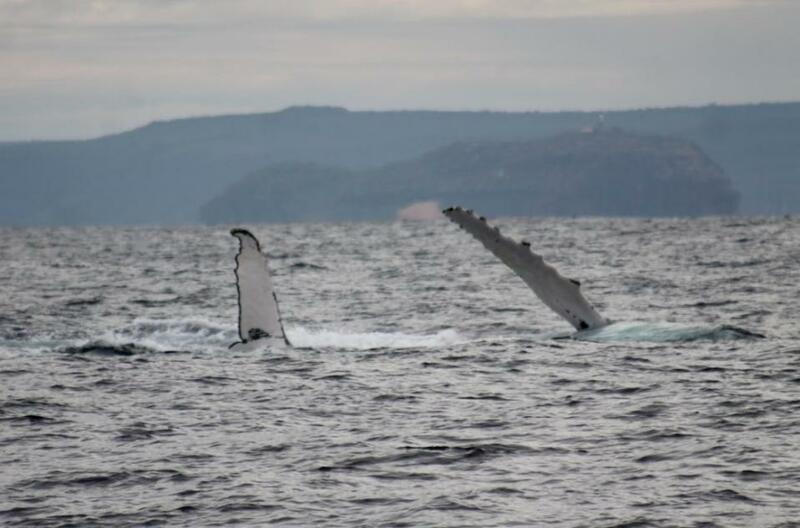 Its whale research program builds on research that has been conducted off Sydney’s Northern Beaches by experts over many years and its Centre for Marine Studies enables students and others to become directly involved. Additionally, Living Ocean raises funds for other vital ocean conservation groups. Living Ocean successfully lobbied NOPSEMA to postpone initial 2D testing in 2017 set to occur in the middle of the southern Humpback migration period. Save Our Coast is a Newcastle-based not-for-profit community, dedicated to protecting marine animals and the coastal ecosystem. They aim to educate, inspire and empower the community to revere and care for our coastal environment. The event, which is supported by The Boathouse and Le Pont Wine Store, will include live music, art and will conclude with an after dark light show. Community members are invited to attend a free drop-in session in Newcastle to learn about governments’ roles in regulating offshore oil and gas activities, including seismic activity, off the NSW coast. oil pollution emergency planning and government response capability. Thursday 7 February 2019, 4.30 – 7.00pm, Newcastle City Hall, 290 King Street, Newcastle. There is no need to RSVP to this event. For more information please email offshoreenvironment@industry.gov.au.